One Diamond Silver Slide Necklace: 1st Anniversary Gift - 25% off! Specially created to celebrate a 1st anniversary, our unique one diamond silver slide necklace... Comes with 1 diamond set in a sterling silver pendant. This pendant has an integral bail, that contributes to its sleek look. 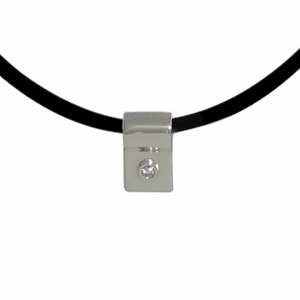 Comes with a black rubber cord which highlights the silver and diamond pendant. The piece is 0.4" high x 0.25" wide.